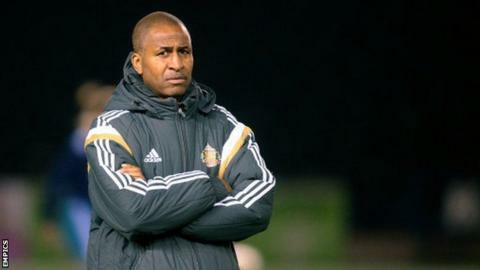 Sunderland Ladies manager Carlton Fairweather says he would "take a draw" when his team host Women Super League One leaders Chelsea on Saturday. The Londoners are yet to lose in any competition this season and are five points clear at the top of the table. Sunderland go into Saturday's match in third place, only behind second-placed Arsenal on goal difference. "You'd never say never but if you're asking me if I'd take a draw now, I'd take a draw," he told BBC Sport. "It's going to be difficult for us to cause them problems but we'll see what we can do." The top two finishers in WSL 1 will be awarded a spot in the Champions League but Fairweather says European football is presently not in his sights. "I've got to admit that at this particularly time, no. Let's look at something like that at the end of the season and we'll see where we are from then," he said. "We've got to make sure that we don't lose sight of what we're trying to achieve and that's to stay up. Until it's mathematically certain I take nothing for granted." Chelsea added England international forward Fran Kirby to their side during the mid-season transfer window and Fairweather expects the visitors to cause his defence problems on Saturday night. "The fact that they've signed Fran will add an extra dimension to their team. With the attacking line-up they're going to have it's going to be difficult."